Type "slime" into any search engine and you’re bound to find a variety of slime-making kits sold through major retailers, links to several YouTube accounts dedicated to slime, and even news articles about people of all different backgrounds playing with slime. Talk to any young person in your community, and it is likely that they have made slime or even started their own business selling it. 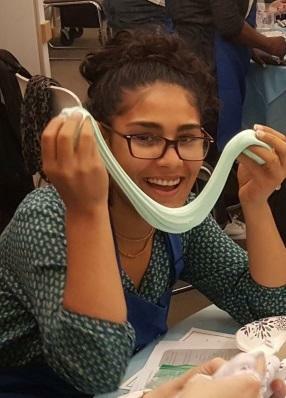 While young people crowd around the opportunity to make slime, some educators hold concerns that slime may be one-note, especially when it comes to getting youth involved in learning and traditional literacy. The Literacy Enrichment Afterschool Program (LEAP) staff recognizes that slime is a popular youth trend and an opportunity to reach youth of various learning backgrounds. Whether youth face challenges or have resistance to traditional literacies, LEAP is utilizing the popularity of slime to connect young people throughout Philadelphia to chemistry, culinary literacy, math and more. In early November, the LEAP curriculum team hosted staff trainings for both adult and teen LEAP staff members with the goal of supporting slime as a well-rounded, STEAM literacy activity for youth visiting neighborhood libraries. LEAP references a book, Karina Garcia’s DIY Slime, which stems from the popular slime and crafting YouTube channel, to share the basics of making slime as well as a variety of slime recipes. Young people learn more about the chemical properties of the ingredients as they experiment with different types of slime. By manipulating the ingredients and measurements of slime, youth can achieve a different end product. Additionally, staff members were encouraged to dive into the chemistry of slime and its real-world applications. Through discussing sinkholes which have appeared in Philadelphia, staff members were able to acknowledge why slime is so captivating. Soil liquefaction, a process that contributes to the creation of sinkholes, holds similarities to the properties you’ll notice with slime. Scientifically, slime falls under the category of being a non-Newtonian fluid, which means it exhibits traits of both solid and liquids, yet it does not completely adhere to either classification. For many young people, playing with slime goes beyond the goopy tactile experience, and includes witnessing slime appear solid, and suddenly move as a liquid. A slime-like substance called oobleck, popularly known from the Dr. Seuss book, Bartholomew and the Oobleck, exhibits this phenomenon even more drastically. 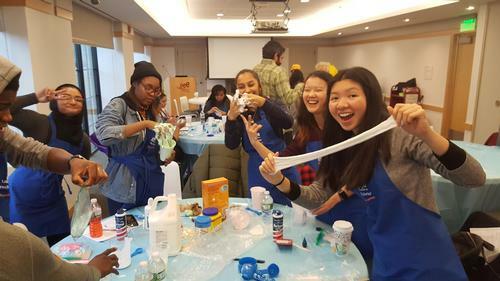 While LEAP is well-known for read-alouds and homework help, hosting slime events goes beyond expectations to engage youth in a way that builds upon several types of literacy. 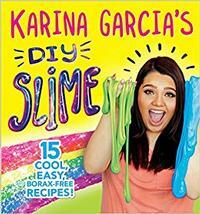 If you know any young people who have not made slime, encourage them to try this youth-approved activity at several of the neighborhood libraries. Check out our calendar for slime-specific dates and locations throughout December. LEAP is a free drop-in program and welcomes youth of all backgrounds from grades K-12. Keep up with the latest LEAP offerings on our Facebook page! Add a Comment to It's Time for Slime!